Chicago web application development from MXOtech. You have a business problem. Whether you struggle with costly data entry mistakes, disconnected technology or outdated systems, MXOtech helps clarify your business problem, execute your vision and measure its success. Using the agile methodology, MXOtech collaborates with your stakeholders to deliver a web application that meets your business goals the first time around. And with fixed pricing, the price you see is the price you’ll pay. By incorporating frequent user testing in the development process, you can be sure all application components actually serve their purpose. Frequent client feedback enables our developers to adapt to changing requirements, keep business objectives in focus and avoid project waste. Let MXOtech uncover the right technology solution for your business! Forget tedious web application maintenance and updates. MXOtech uses modern coding patterns and practices that provide maximum reuse and flexibility so your web application stays cutting-edge for years to come. See working components of your code throughout the web application development process. MXOtech’s collaborative project management process ensures the final web app meets your expectations and is delivered on time and on budget. Choose from on-premises or hosted web application development. MXOtech develops, implements and maintains hosted solutions for Chicago-based businesses — including help-desk services. Our HITRUST CSF certification helps ensure that your healthcare applications exceeds the healthcare industry’s complex data privacy and security regulations. Does your healthcare organization experience costly data-entry mistakes as a result of time-consuming, manual processes? Improve quality across your healthcare organization by leveraging data from healthcare EMR and the Electronic Data Interchange (EDI). An effective web portal can automate manual processes and expose areas for improvement across case management, modeling and reimbursement. MXOtech provides web portal development solutions for healthcare insurers, clearinghouses, hospital systems and accountable care and provider organizations. Our custom solutions cover complex case management, HEDIS measures, patient and provider transactions and management of EDI transactions. Does your energy or utility company want to connect with customers and empower them to make smarter decisions? Energy and utilities web portals display usage data and other customer information to help them track and manage consumption. You can use web portals for demand reduction or time-of-use programs — or simply to educate customers on energy consumption habits. MXOtech offers customized Chicago web application development solutions for energy and utility companies to display consumption data, pricing data and other information that helps customers manage their energy consumption. We hire the best of the best. Our Chicago-based team of experienced project managers, developers, engineers and analysts work side-by-side with your key staff to understand your needs. Our development process is collaborative. Nobody likes surprises when it comes to business applications. You’ll test key functionalities throughout the process and give frequent user feedback. As a result, we ensure the final product meets your expectations and is delivered on time and on budget. We eliminate your biggest business challenges. Through business process improvement, we uncover operational inefficiencies that are holding you back. We build custom applications that bring greater productivity, cost savings and data accessibility to your business. We build applications for the future. We do the hard work to make sure your applications are logical and intuitive for all users. With your business goals in mind, we build scalable solutions that adapt quickly to organizational changes and growth. While there were several other application development companies we could have gone with, we chose to work with MXOtech because we had the utmost confidence in your abilities. Based on our past experience with your team, we knew we could count on MXO to get this job completed on time and on budget with zero fuss. 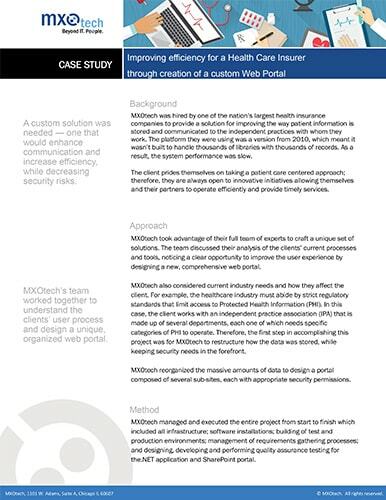 MXOtech was hired by one of the nation’s largest health insurance companies to provide a solution for improving the way patient information is stored and communicated to the independent practices the company works with. your business processes to keep you running at full speed. Whether managed IT services, custom web application development or a combination of both — your technology needs are our top priority. Our experienced team of tech thought leaders, engineers and software developers represent the best in Chicago and the region. With award-winning performance, MXOtech’s custom Chicago web application development services can propel your operational performance and profitability.